Lately I’ve been simmering brisket in homemade enchilada sauce to make some big batches of fiery Shredded Beef. And since you’re already an expert at making your own enchilada sauce (right?!!) then you can consider this an easy way to make some ultra-flavorful beef that will work wonders in tacos, burritos, enchiladas, etc. 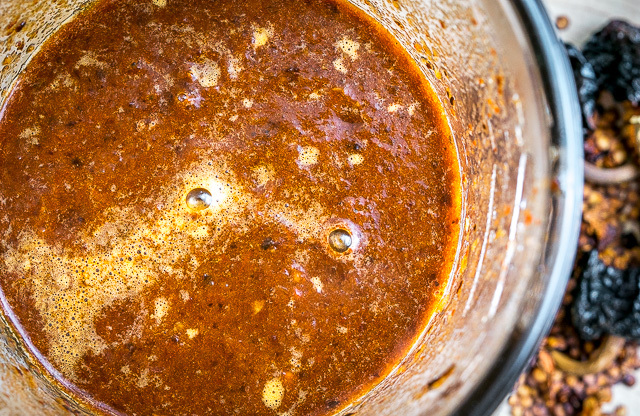 Like you, I keep jars of this Ancho enchilada sauce in the freezer and will be grabbing a couple of those for this beef recipe. 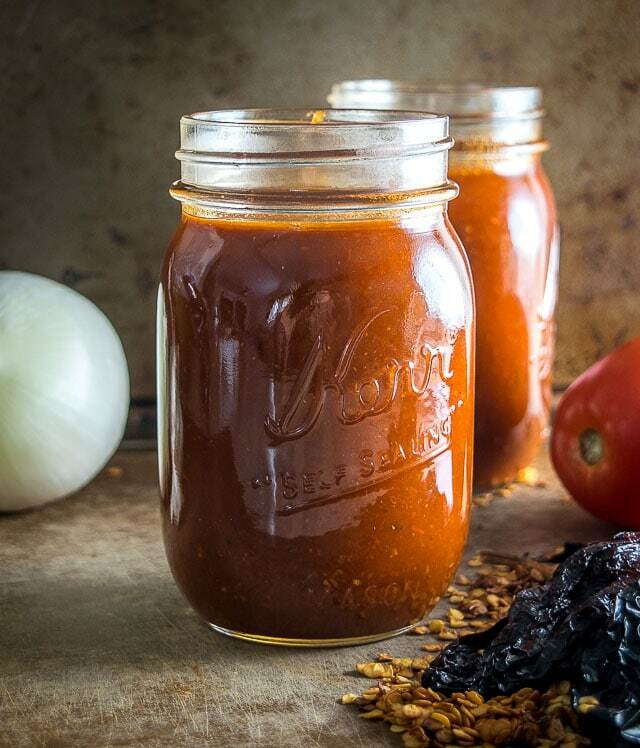 It’s a wicked sauce to have in your repertoire — with loads of flavor from the Ancho chiles and some sweetness from the roasted tomatoes. Make it once and you’ll never go back to enchilada sauce from the can! But I’ll also include details on how to make it from scratch if your freezer isn’t yet offering up jars of this wonder sauce. Try to buy the ones that are pliable, like big raisins. If they’re hard or brittle then they’re a bit past their prime. Give ’em a once-over with a wet paper towel, wiping off any dusty crevasses. Then de-stem and de-seed them. I usually just cut off the stem and make a slit lengthwise with the knife, then you can use your hands to pry them open and dump out the seeds and veins. Giving these chili pieces a heat bath will wake up some dormant flavors, so I usually plop them in a 400F oven for 1-2 minutes. Alternatively, you can flash roast them on a hot, dry skillet for 15-30 seconds per side. Either way, just know that they don’t want to be kept in the heat for too long or they’ll turn bitter, so it’s always best to use caution and keep a close eye on them. 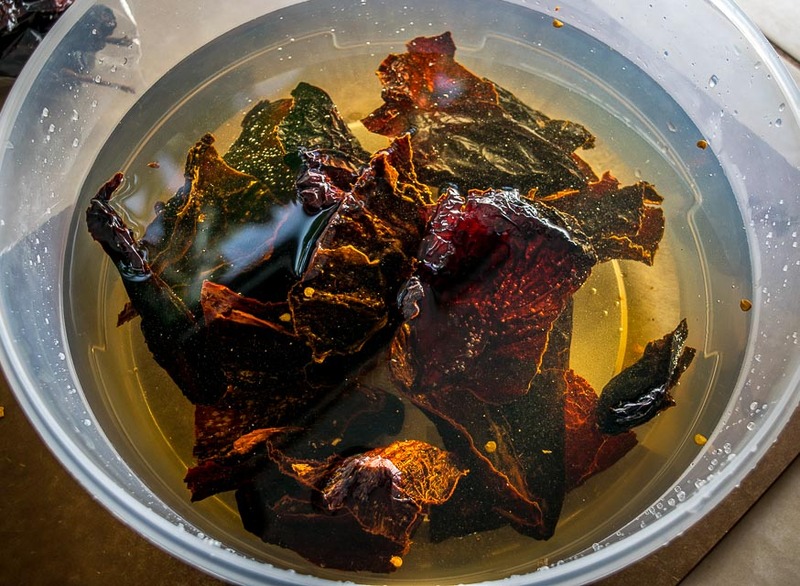 Add the roasted chili pieces to a mixing bowl and cover them with the hottest tap water you’ve got. Meanwhile, we’ll roast 4-5 tomatoes in a 400F oven. You could also roast these on the stovetop but I default to plopping them in the oven — they’ll need about 20-30 minutes to fully roast but since we have an extended simmer coming up I will usually just grab ’em when I need them. Once your tomatoes are roasting, add a dollop of oil to a skillet and saute 1.5 onions and 4 whole, peeled garlic cloves. Once the onion is starting to brown, approx. 7-8 minutes, add this mixture to a blender where it will wait patiently for the other ingredients. Meanwhile, you can start prepping the meat. Trim off any large pieces of fat and give it a healthy dose of salt and freshly cracked black pepper. Heat up a thin layer of oil over medium-high heat. Add the beef pieces and give them a few minutes on each side, or until they start to brown. I find it easiest to use tongs to make sure all sides are browned. 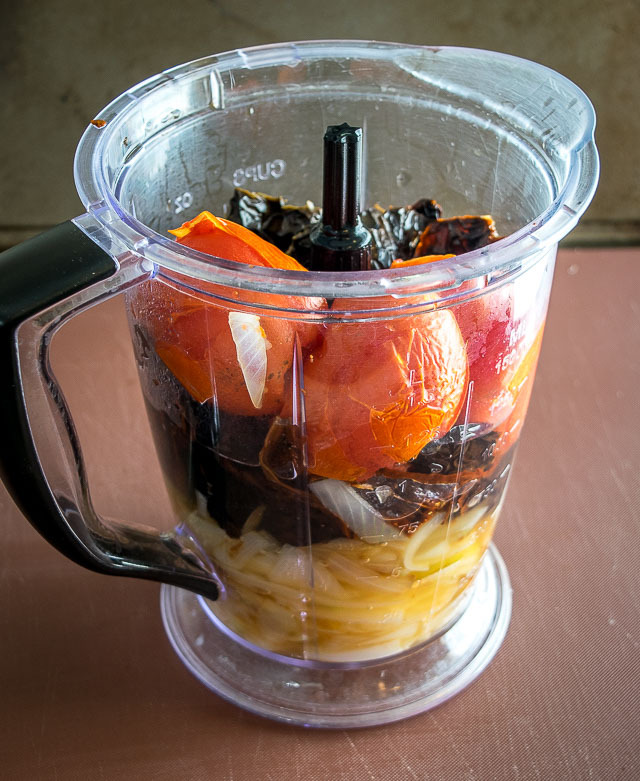 As the beef is browning, we’ll combine the rest of the ingredients in the blender. Instead of political orientation, it can be easier to split the world’s population into two distinct groups based on their palate: those who like the taste of the chilis’ soaking liquid, and those who don’t. So before you drain the reconstituted chiles grab a spoon and take a taste of the soaking liquid. Does it taste bitter to you? Or maybe you think it tastes earthy and you like it? 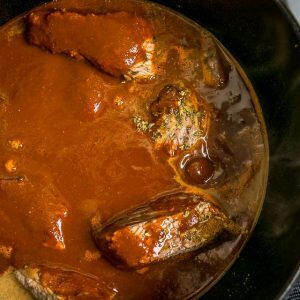 It usually tastes slightly bitter to me, so I use homemade stock in the enchilada sauce. But if you like its flavor then you can use the soaking liquid in place of the stock (or a combo of both). 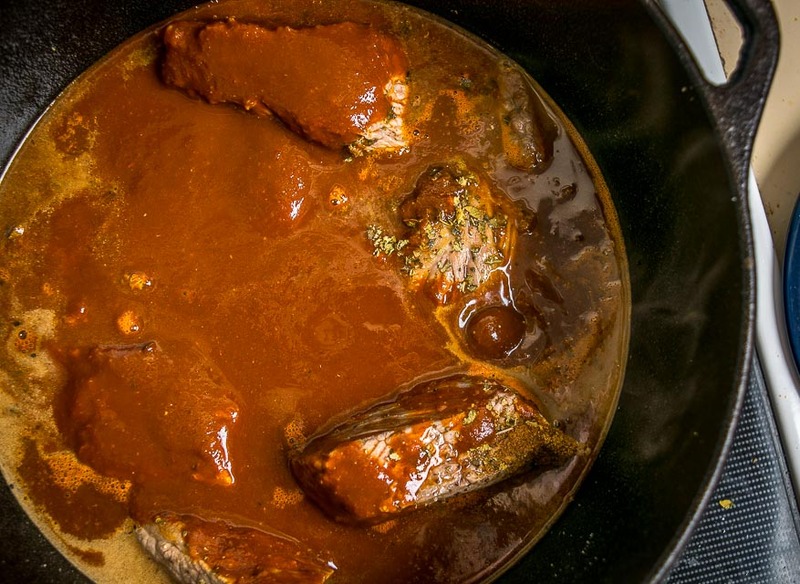 Using the soaking liquid will give you a more earthy, astringent sauce. 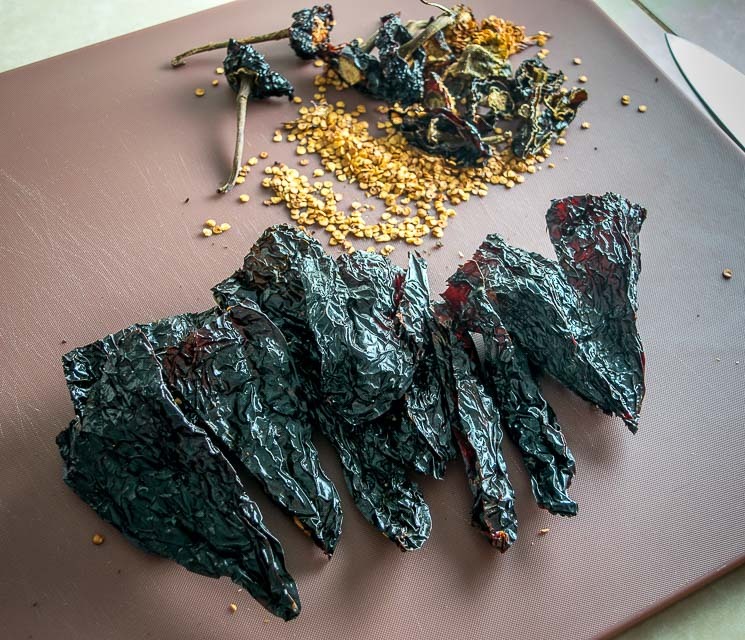 I prefer the middle ground where the flavor of the dried chilies is balanced with stock and some sweetness from the tomatoes, but you can always adjust the proportions to suit your palate (see our Colorado Enchiladas for an example of an enchilada sauce that omits the tomatoes). Okay, give these ingredients a whirl until they have fully combined into an enchantingly colored liquid. I usually strain this sauce to get rid of some leftover seeds and pieces of skin. But it can be a pain because you have to force the sauce through the strainer with a spoon or spatula. Every time I do it I swear it will be the last because I don’t think it affects the flavor too much, but it results in such a beautifully silky texture that it can be hard to skip. 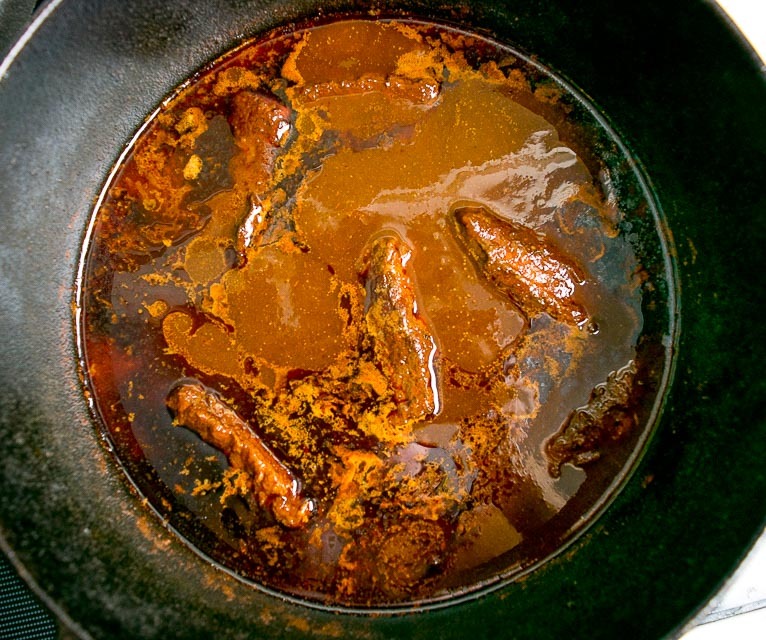 Let the stock boil and deglaze the pan — be sure to scrape up any fond that got stuck to the pan as it is loaded with flavor. Add the enchilada sauce to the pan. And if you strained it, take a moment to admire that silky smoothness! You’ll have loads of sauce if you’re making it from scratch (approx. 5-6 cups) so don’t be surprised if it completely submerges the meat in your pan. Once the sauce warms up we’ll reduce the heat to a quiet simmer (medium-low on my stove). Cover the pan and let it simmer for 2-4 hours. This will give the collagen-rich meat plenty of time to break down. The exact simmer time will vary so I think it’s best to start checking it after a couple hours. That’s some fat that’s risen to the surface. You can skim off and discard as much of this fat as you want using a ladle or spoon. Once the meat is fork tender then it’s done. This batch simmered for 3 hours. 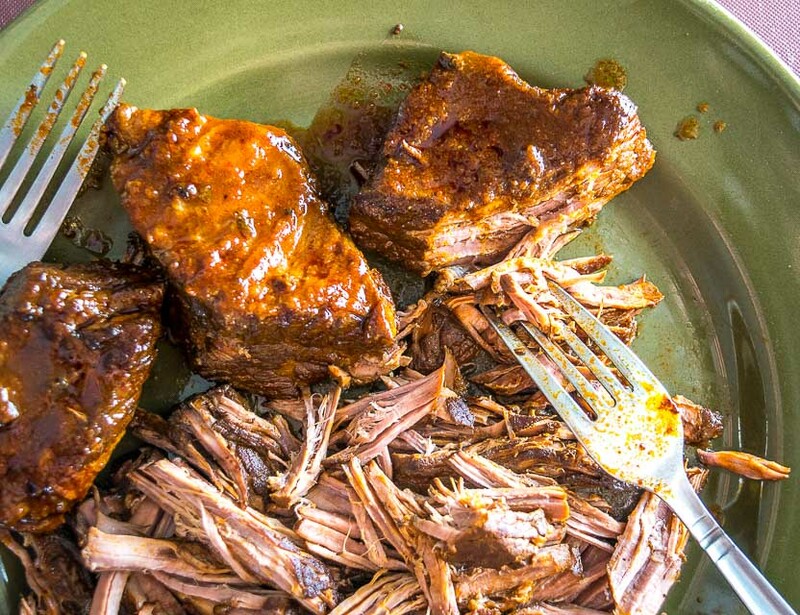 Shredding the meat should be effortless. If it still feels a little tough then most likely you need to simmer it a bit longer. And now the most important part, testing the sauce! There are quite a few variables going on here, so once you’ve pulled the meat from the pan it’s time to give a final taste to the sauce. 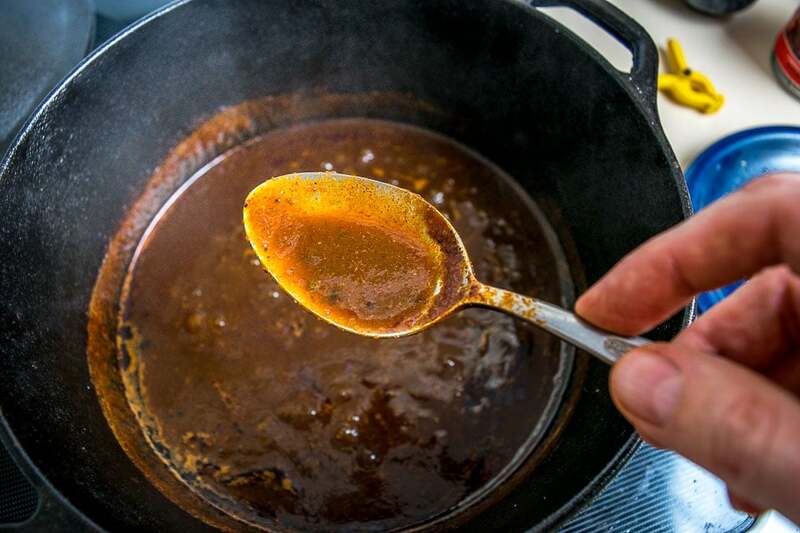 Most likely you’ve got a big, bold flavor on your hands — an Ancho based enchilada sauce that’s been amped up with some hearty beef flavor. Nice! Beef can have a selfish flavor and if it’s dominating then you can easily balance it out at this point. And then I turned the heat up to medium-high to reduce it down slightly (optional). After these adjustments it tasted “right” to me. The simmering beef gives the sauce such a deliciously rich and complex flavor that will probably taste familiar to your tastebuds. You’ll only need a portion of the sauce to coat the shredded beef. I removed about half of the sauce before adding the meat back to the pot. And why would I set aside some of the sauce? Because a little goes a long way and you can use it to make some killer burritos and enchiladas. Similar to the recent Chili Verde recipe, if you use the recipe proportions listed down below you’ll end with loads of sauce and that’s the whole idea! Soften up some corn tortillas. Add a splash of the sauce to a plate and dredge a tortilla in it. 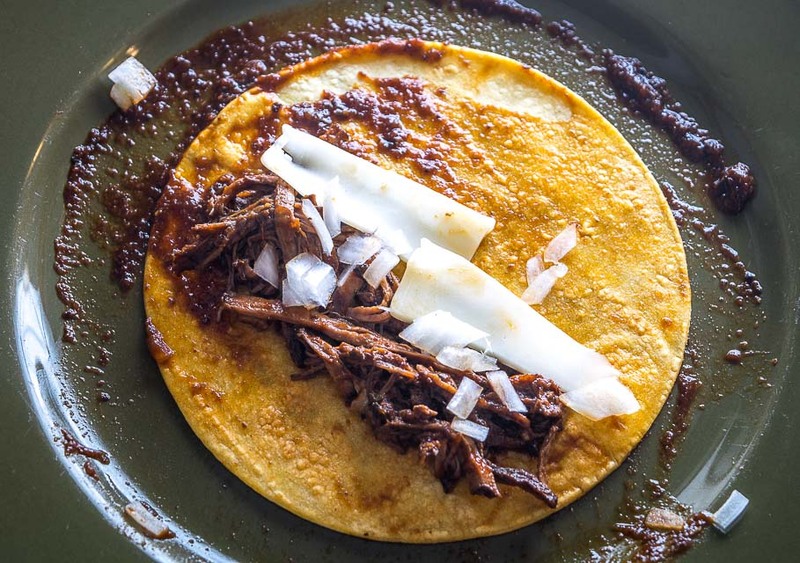 Flip the tortilla and add some of the shredded beef, cheese, and raw onion. Roll tight and add to a baking dish. And now drench the enchiladas in your extra sauce! Add a layer of cheese and bake for 10 minutes or so, or until the cheese is melted. You should have plenty of sauce so feel free to load up the baking dish with some extra spoonfuls. 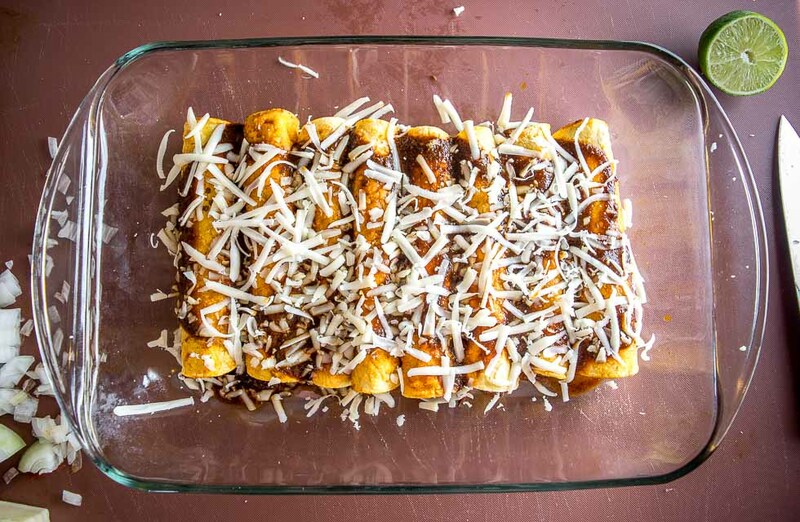 These enchiladas are massively rewarding — a double whammy of the fiery shredded beef and the surplus sauce you now have on your hands. 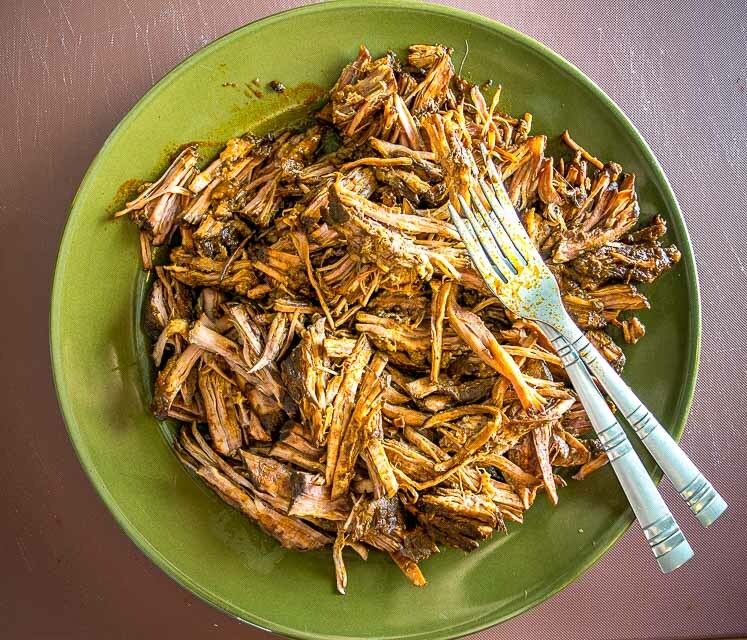 Okay, I’ll put up some additional recipes using this Mexican Shredded Beef in the coming weeks — it’s wildly versatile and you can make all sorts of on-the-fly meals with it so feel free to get creative. 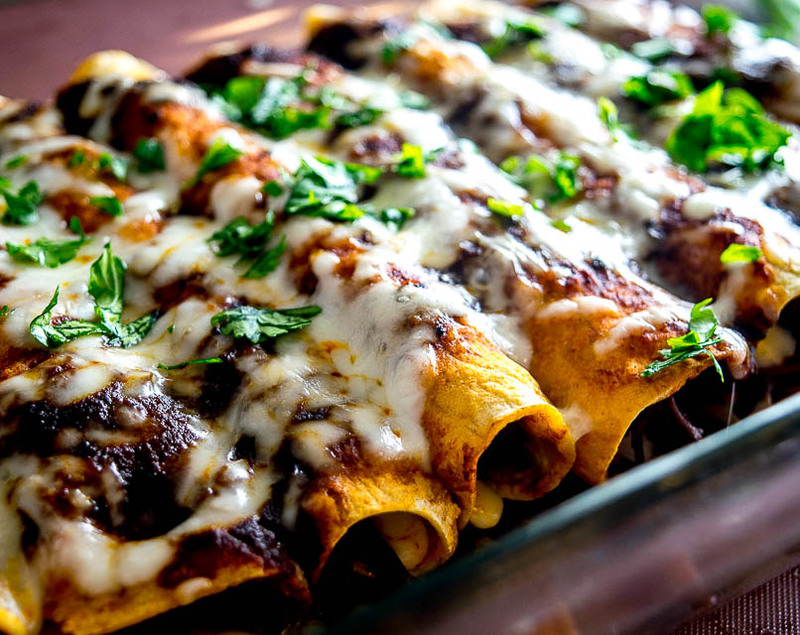 In the meantime, you can always reference the Ancho Chicken Enchiladas recipe to see more details on making enchiladas. 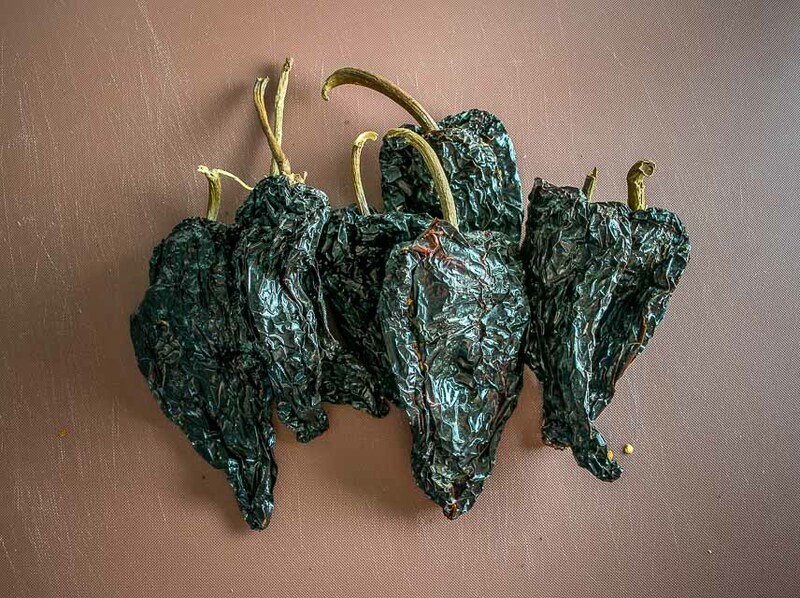 And let me know if you have any questions about the enchilada sauce — it’s a great recipe to have in your repertoire and it will get you familiar with the beloved Anchos if they’re new to your kitchen. Lately, I've been simmering brisket in some homemade enchilada sauce to make big batches of Mexican Shredded Beef. Yum!! 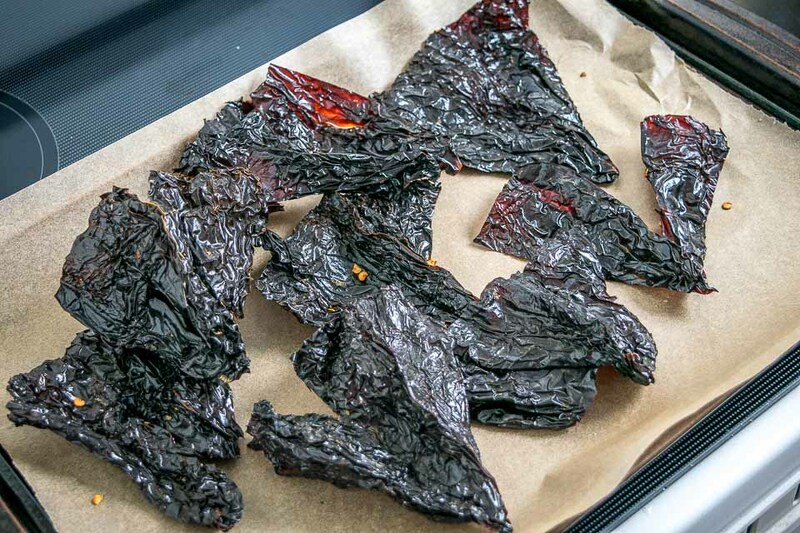 If you're making the enchilada sauce from scratch, start by wiping off any dusty crevasses on the Ancho dried chilis. De-stem and de-seed the chilis, but don't worry about getting rid of every last seed. 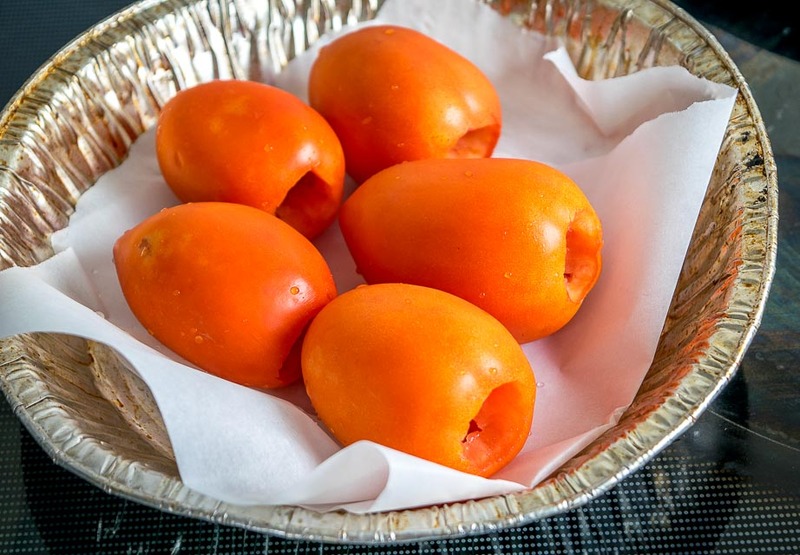 Roast the tomatoes in a 400F oven for 20-30 minutes (or until you need them). Roughly chop 1.5 onions and peel 4 garlic cloves. 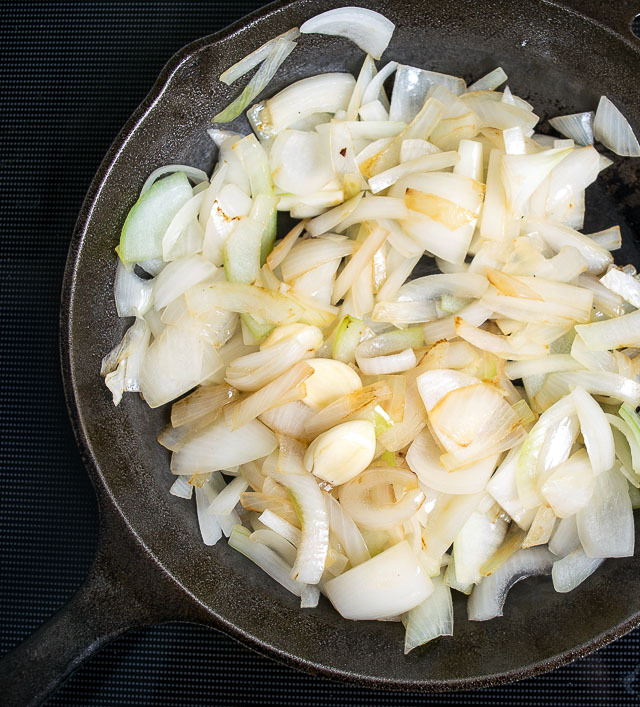 Add a dollop of oil to a skillet on medium heat and saute the onions and whole garlic cloves until lightly browned. 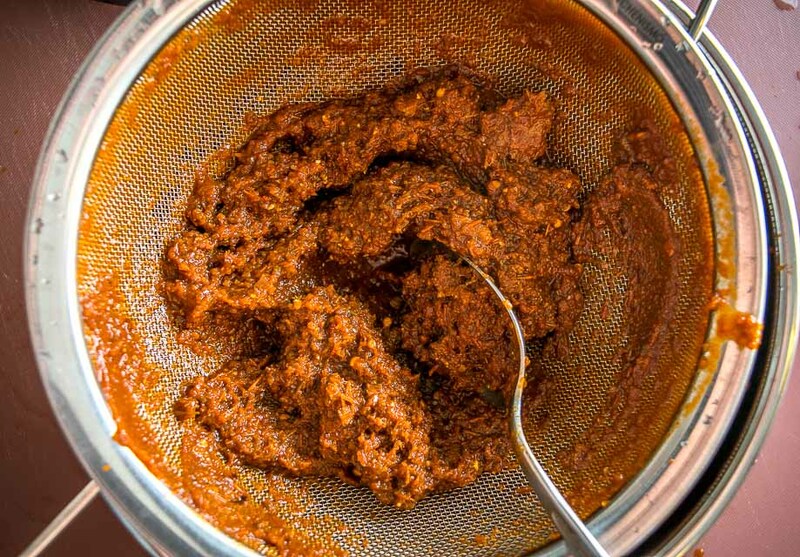 Strain the sauce through a fine-mesh sieve and discard the leftover skin and seed remnants. You might have to use the back of a spoon to push the sauce through the strainer. 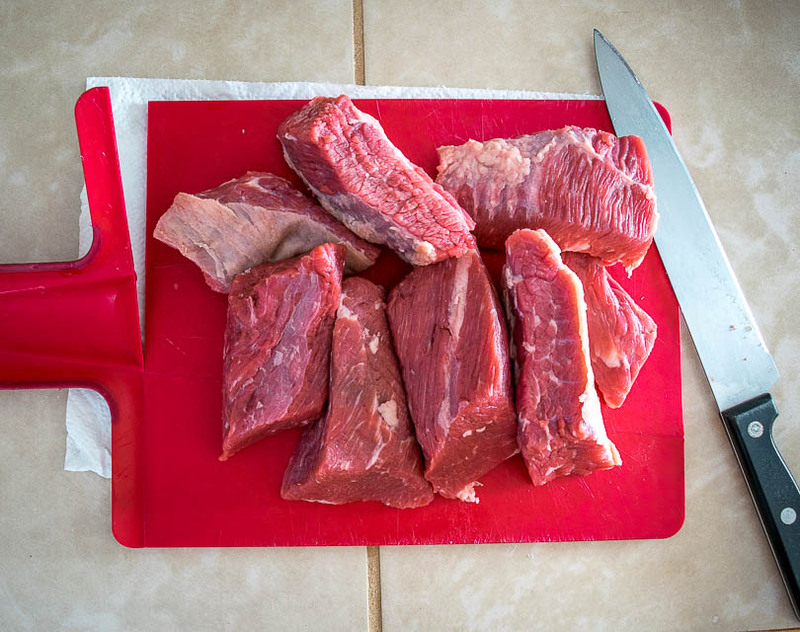 Trim the beef and discard any unwanted pieces of fat. I usually cut it into 2-3" chunks. Season generously with salt and pepper. 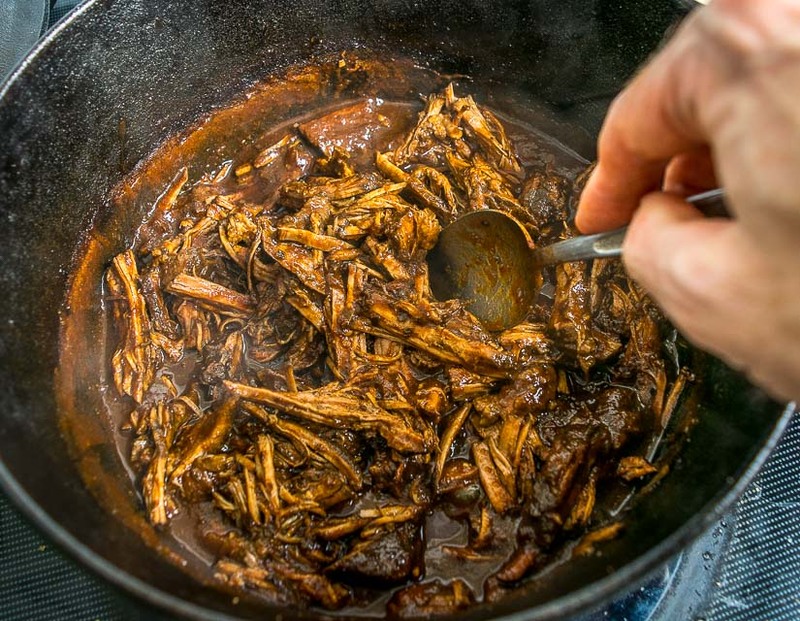 Heat a thin layer of oil over medium-high heat in a Dutch oven or saucepan. Once the oil is hot add the beef pieces and brown on all sides, approx. 3-4 minutes per side. Add 1 cup of stock to deglaze the pan, scraping up any bits of fond that have stuck to the pan. Add 2 teaspoons Mexican oregano, 1/2 teaspoon cumin, 1 teaspoon salt, and some freshly cracked black pepper. Add the strained enchilada sauce to the pan. Once boiling reduce the heat to a quiet simmer (medium-low on my stove) and cook for 2-4 hours or until the beef is fork tender. This batch simmered for 3 hours. Once the meat is fork tender, remove it from the pan and shred it using 2 forks. Take a final taste of the sauce for seasoning. I added: salt, Mexican oregano, a pinch of cumin, some hot chili powder, and a squeeze of lime. You can optionally raise the heat to reduce the sauce down if you want a thicker sauce. You can also skim off any fat at this point if you want to. 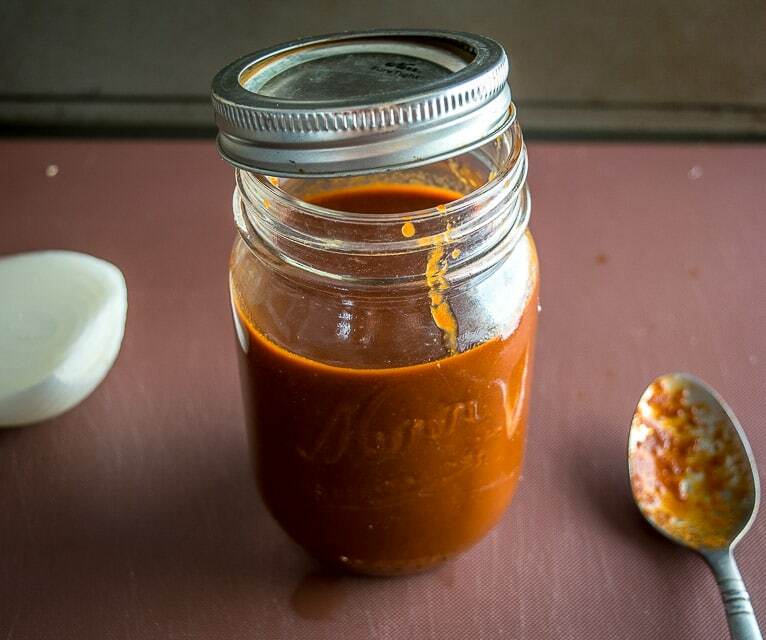 Once you're happy with the final flavor of the sauce, set some aside to be used later. I removed about half of the sauce before adding the meat back in to coat it. Once the meat is coated with the sauce you can serve it immediately. I usually give it a final squeeze of lime as this really brightens it up. Store leftovers in an airtight container in the fridge. 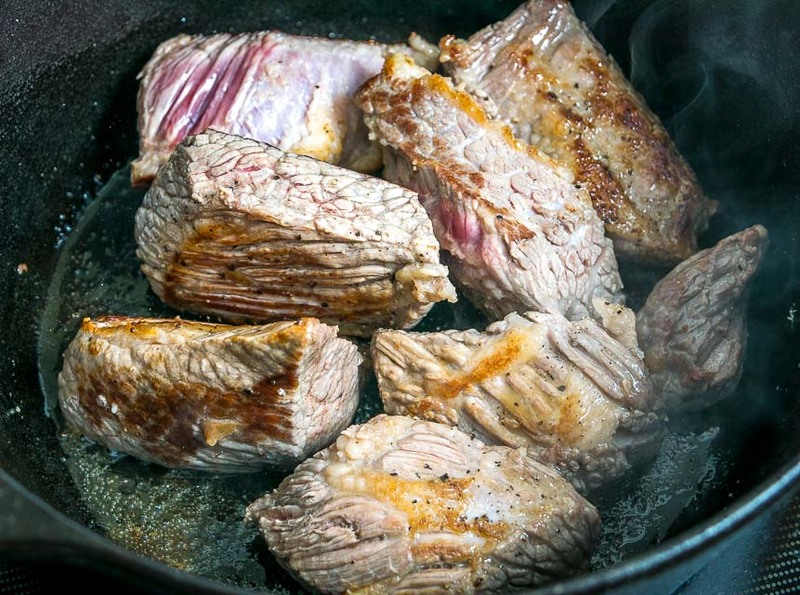 The exact simmer time for the meat will depend on your setup. I usually start checking it after a couple hours. When it's fork tender and pulls apart easily then it's done. If you're making the sauce from scratch you'll have loads of it -- I usually set some aside for future use before adding the shredded beef back to the pan. Be sure to take a taste of the chilis' soaking liquid after they have reconstituted. If it tastes good to you then you can always use some of it in place of the stock in the enchilada sauce. Taking a final taste of the sauce after the beef is done cooking is crucial! Sometimes the beef flavor will dominate at this point but you can easily pull it back by adding in some aromatics. For details on making enchiladas with this sauce you can reference the Ancho Enchiladas recipe. 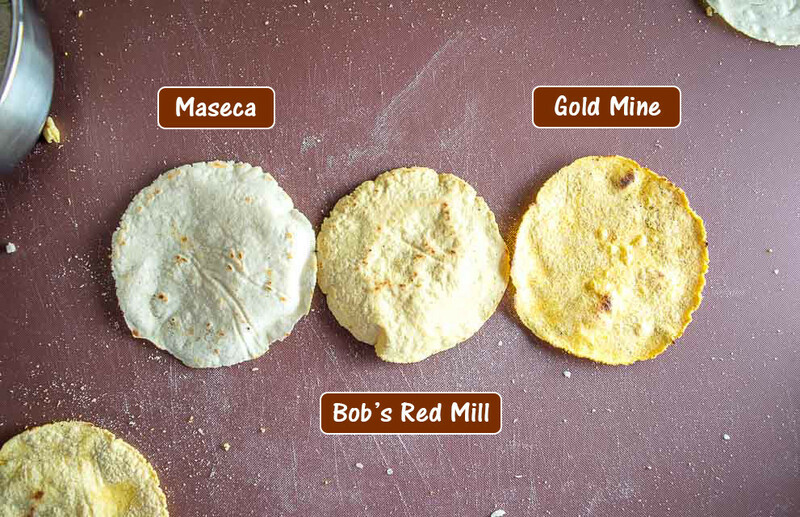 Our latest article is a side-by-side comparison of 3 Different Masa Harinas. You talk about freezing sauce with in glass containers with the lids off or using zip lock bags. Why? for around $125 you can buy a vacuum sealer with a good starting assortment of bags at Costco. No air in your container to encourage spoilage. I make large batches of involved recipes, buy whole muscles of expensive meat and cut it up to freeze etc seal it and freeze it. I have a stand alone freezer. Also have a generator and supply of gas. In the event of a prolonged emergency, we’ll eat well. Hey thanks for mentioning this George, that’s some new gear to me but good to know for the future. Cheers. I’m working my way through your site and had some of the enchilada sauce in the freezer so decided to make this Mexican Beef, then followed up with your suggestion for enchiladas using the extra sauce. Instead of raw onions, I used your picked onions and topped with a little homemade Mexican crema for serving. Wow. I will say that I haven’t been totally pleased with any of the corn tortillas I have purchased and since my Bob’s masa flour just arrived, I’m going to try making my own! I hope my husband doesn’t tire of Mexican food, but he is from El Paso so I don’t think he will! Hey Debbie! Wow that dish sounds like a real treat with all those homemade elements! Good luck with the tortillas I hope they treat you well.